Co-presented by MINDPOP, The Kennedy Center and Austin Independent School District, The Kennedy Center Southwest Arts Integration Conference convenes educators of all types for two days of immersive workshops exploring the meaning and practice of arts integration in schools. Teachers will learn ways to integrate the arts throughout their curricula and harness the power of the arts for learning. School Administrators and school leaders will learn ways to expand arts integration throughout a school. Teaching Artists will have the opportunity to expand their thinking about arts integration. 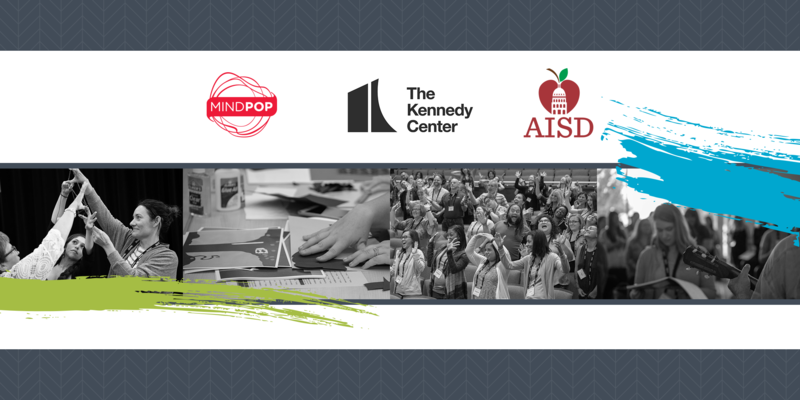 Join us in Austin for this one-of-a-kind professional learning experience! Special rates available for groups of 10 or more. Inquire at info@mindpop.org. MINDPOP encourages persons with disabilities to participate in all of its programs and activities. If you anticipate needing any type of accommodation or have questions about the physical access provided, please email us at info@mindpop.org in advance of the conference. Includes Free airport shuttle and on-site parking. Close walking distance to river and downtown attractions. Reserve by May 22, 2019 for special rates. From our stages to classrooms and communities across the country, the John F. Kennedy Center for the Performing Arts sets a national standard for arts learning. Working through model programs and a nationwide network of partners, the nation’s cultural center harnesses the power of the arts to address education challenges, accelerate best practices, and uplift citizen artists. Across all its programs, the Kennedy Center is committed to increasing accessible, inclusive opportunities for all people to participate in, learn about, and learn through the arts. The breadth of the Kennedy Center’s education initiatives is unparalleled, with customized experiences and myriad access points for people of all ages and backgrounds: from the burgeoning artist, the curious explorer, the student (of any age), the educator, the civic leader, the school administrator, and teaching artist—any person interested in arts learning. With learning opportunities offered in all 50 states, 29 countries, and globally through its online resource ArtsEdge.com, the Center offers more than 40 differentiated programs that directly impact more than 1.4 million students and indirectly impact millions more. One of the more than 40 programs is the Changing Education Through the Arts (CETA) program which provides professional learning for teachers in partner schools committed to a school-wide focus on arts integration as an approach to teaching and learning. The CETA program offers professional learning for teachers across the country and globally through the annual Arts Integration Conferences—in DC and, in 2019, Austin, TX and Sacramento, CA. As an essential component of the living memorial to President Kennedy, the Center’s Education programs utilize the arts to embrace President Kennedy’s ideals of service, justice, freedom, courage, and gratitude. By cultivating the citizen artist in everyone, the Kennedy Center brings the arts and creativity to the center of our lives. For more information, please visit kennedy-center.org/education/.